Still working through things. We were right in the path of Hurricane Michael (like so many others), and while the family is safe (pups, and parents), the house didn't fair as well. Baby steps back into the blogging world and started to grow, so you know, a post here, a post there, and away we go! Hope you stay along for the ride! Welcome back to Satisfaction for Insatiable Readers. From the bestselling author who brought us Perfect on Paper and Cassidy Lane comes the tale of a young woman who wakes up one day and decides to start over. Katrina Lynden has always walked a straight line in life, an approach that has resulted in a stable career and pleased her hard-nosed parents but that has also left her feeling unfulfilled and miserable. When her best friend suggests they quit their Silicon Valley jobs and embark on two months of adventure in New York City, Katrina balks at the idea but ultimately agrees, terrified yet proud of herself for finally doing something interesting with her life. But when her friend has to back out at the last minute, Katrina finds herself with a tough decision to make. Much to her surprise, she summons the courage to go alone, and the resulting journey is transformative, both emotionally and physically. Along the way she makes new friends, loses others, learns what is really important to her, and finds a way to grow up without leaving herself behind. This was another wonderful story from an author whose work I thoroughly enjoy. My first two adventures with her writing were Bridges and Wait for the Rain...both great reads, if you haven't already checked them out, I highly suggest you do. This time, around, she takes us smack dab into the center of the Big Apple 🍎, a place that can be teeming with those heavy hitting New Yorkers only interested in furthering themselves, and yet, she doesn't forget to bring the heart along for the ride. In the end, it was a wonderful story filled with ups, downs, and in-betweens I won't soon forget, and characters that you'll love to love and love to loathe, depending on the situation...trust me, it happens. 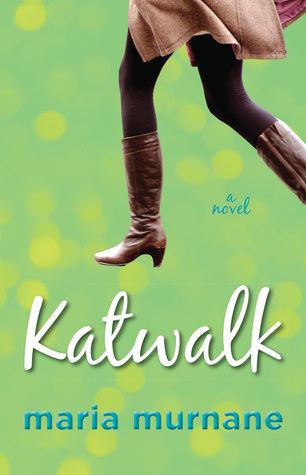 Chick-Lit and Women's Fiction fans, this is a book for your must read list! A former PR executive who abandoned a successful career to pursue a more fulfilling life, Maria Murnane is the best-selling author of the Waverly Bryson series (Perfect on Paper, It’s a Waverly Life, Honey on Your Mind, and Chocolate for Two, which received a starred review in Publishers Weekly), as well as Katwalk, Wait for the Rain, Bridges and International Book Award winner Cassidy Lane. At her speaking engagements Maria shares the “story behind the story,” an entertaining tale of courage, passion and perseverance that has inspired audiences across the country to follow their dreams—no matter what. Special thanks to author Maria Murnane for the ecopy for review. (THANKS!) For more information on this title, the author, or her other works, feel free to click through the links provided above. This title is available now in "tree" and "e" formats, so stop by your favorite virtual or brick and mortar retailer today to snag a copy to call your own. Until next time, remember...if it looks good, READ IT! Curl up in front of the fire, with this fun, festive read. Daisy Jones has hit rock bottom. Or so she believes. A cheating boyfriend, trouble at work, having to move back in with her mother, and being forced to compare her brother's loved-up, newly-wed status and brand-new shiny house with her own dire lack of prospects, isn't what she imagined her life was going to be like at thirty. To top it all off, Christmas, is just around the corner! 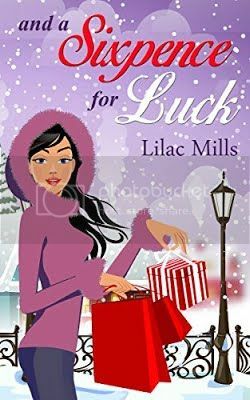 Daisy, bless her, thinks things can't possibly get any worse, but when her ancient great-grandmother persuades her to plant a silver sixpence in the Christmas pud for luck, Daisy is about to discover that they most definitely can. Lilac spends all her time writing, or reading, or thinking about writing or reading, often to the detriment of her day job, her family, and the housework. She apologises to her employer and her loved ones, but the house will simply have to deal with it! When she isn’t hunched over a computer or dreaming about foreign shores, she enjoys creating strange, inedible dishes in the kitchen, accusing her daughter of stealing (she meant to say “borrowing”) her clothes, and fighting with her husband over whose turn it is to empty the dishwasher. Special thanks to Cami at RABT Book Tours for the chance to bring this tour to you. (THANKS!) For more information on this title, the author, THIS TOUR, or those on the horizon, feel free to click through the links provided above. This title is available now, so click on over to your favorite online retailer to snag a copy today! Can you believe that it's almost October? I know I sure can't....except that the calendar app on my phone is staring me in the face with today's date because Mother Nature is certainly ignoring any weather changes that should be occuring. You hear that, Mother Nature! How about a little cool weather, huh? Pretty please?! Anywho...with the (usually) cooler weather comes yet another oh-so-convenient excuse to stay indoors and READ READ READ (or find a lovely spot outside in the brisk cool air...whatever floats your boat). Callax is fifteen, and he already knows he won't ever grow old. Twelve years after leaving the childstation he will be summoned to the Gathering, where life essences are taken by a deadly, irresistible spell. On his world, this is one of the many ways in which the Exta serve the Opta. His best hope is to avoid an early binding by staying out of trouble. But in protecting his younger brother Benedar, he was noticed by the Breaker, the evil magician in charge of the Gathering. The closer Callax gets to the ruling house and the girl who lives there, the more he learns, and the greater the danger. A danger he might not understand until it is too late. Callax thinks the Breaker’s defeat will save him, but he is wrong. Additional information: Although Breaking Magic is part of the Legacy of Androva series, it can also be read independently. If you have read Controlling Magic and want to know more about Imbera, Breaking Magic is Cal’s story. The book retells part of Controlling Magic from Cal’s point of view. Recommended for lower young adult. Magic, danger, love, war, hidden histories, and daunting futures...in other words, quite the rush! There is so much going on between these pages that I kept forgetting to update my reading status on GoodReads. I would just get lost in the story that I'd look up and see oh, look at the last time I mentioned something and well, yeah...reading now. What can I say? I LOVED it! Cal was a much more complex character than he at first seems...the old saying "never judge a book by its cover" definitely applies. Benedar was annoying at first, understandably so as well, but grew on you for not only his brains but his heart. It was the unaccounted for connections that really drew you in, the ones that you didn't see coming, while the curious concepts explored kept you pondering just WHAT it all meant, WHY they were all there, WHO was behind it all, and HOW they might escape a fate worse than death! In the end, it is definitely a work to escape into for a spell...(inside joke)...and, in my humble opinion, a must read! Though they say "recommended for lower Young Adult" fans, I beg to differ. While that grouping may enjoy it as well, the world created, concepts involved, and intensity of the plot, lead me to say save it for the higher end of the YA spectrum straight through to adult Fantasy fans. I mean, really...that Breaker dude...whew! SCARY STUFF...but oh so good! This is me (probably stating the obvious). I'm the author. I've written five books about the Legacy of Androva so far. Book six is on its way and will hopefully be released in early autumn 2017. The stories are contemporary fantasy, aimed at lower YA / upper MG, and I hope that they can be enjoyed by adults too. Ever since I was old enough to figure out there was probably no such thing as magic, I always (secretly!) hoped it was some kind of mistake. Surely it must exist somewhere? Eventually I decided it must have been lost or forgotten somehow. And that's where the idea for Stealing Magic (the first book) came from. I live in the South of England with my husband and two daughters. When I'm not at work, or writing about magic, I also enjoy reading and photography. Special thanks to author Alex C. Vick for the signed copies for review. (THANKS!) For more information on this title, the series, or the author, feel free to click through the links provided above. This title is available now as are the beginning books in the series, so seek thee out a copy at your favorite online retailers today! Like what you see? Pass it on! Silver Dagger Book Tours presents... WILDFIRE AND ROSES by Hope Malory - EXCERPT + GIVEAWAY! BLOG TOUR: Lady Derring Takes a Lover by Julie Anne Long - REVIEW + GIVEAWAY! Rockstar Book Tours presents... QUEEN TO ASHES by Mallory McCartney - SPOTLIGHT + GIVEAWAY! Rockstar Book Tours presents... THE DATING ALTERNATIVE by Jennifer Woodhull - EXCERPT + GIVEAWAY! Search for books and movies by plot, character, style and setting! Review - Good News! It's Easter! Nayu's Gaming Time #24 My Time At Portia Launch day! STORYBOOK SUNDAY has gone to the animals! STORYBOOK SUNDAY: Fairy Tale Edition + GIVEAWAY! Visit GMR's profile on Pinterest. Share book reviews and ratings with Gmr, and even join a book club on Goodreads. Winston: Earned his wings 06/03/10, 16 yrs young. Gone, but not forgotten. Sadie: Earned her wings 11/01/16. Gone, but not forgotten. Hailey: Earned her wings 02/27/18. Gone, but not forgotten.